Bob Hope was a very successful comic entertainer, easily one of the most recognized Hollywood personality to the Nation and to the World. Active in all fields of the business, Hope scored first on radio, then films, then television; he wrote books, he entertained troops in war zones — it's hard not to give Hope a lot of props. Born to English and Welsh parents who emigrated to America when Leslie was five, the family settled in Columbus, Ohio. Always doing skits and impressions, young Leslie performed on the streets for pocket money. In his teens, he undertook to establish himself as a boxer. A girlfriend asked him to join her at dancing school; he eventually formed an act with Lloyd Durbin. In 1925, Fatty Arbuckle saw he act, and got them work with Hurley's Jolly Follies — a vaudeville company. Forming a new act called the "Dancemedians" Hope had teamed up with George Byrne and the Hilton Sisters — Siamese twins who danced. By the 1927-1928 season, Lester Hope was appearing on Broadway in Sidewalks of New York. He was in the cast of Ups-a Daisy in late 1928.
in 1929, he changed his name to Bob, and was startled when he flopped in a sceen test for Pathé. In early 1931, he had his own show, Bob Hope at the Palace on Broadway, but spent the next couple of years on the road and on Boradway. It was around this time that Hope met Bing Crosby, with whom he would have many dealings. He starred in the Jerome Kerns / Dorothy Fields musical Roberta in the 1933-1934 season, and toured some with the show. He married his beloved Dolores in February, 1934. During this time, Hope had been trying to break into films by making short comedies, the first of which, Going Spanish, was released in March, 1934. He filmed these during the day out in Fort Lee, New Jersey, while appearing on Broadway in Say When in the 1934-1935 season, Zeigfeld Follies of 1936 in early 1936, and Red, Hot and Blue in the 1936-1937 season. He was also appearing on radio during this time, receiving his first show, the Woodbury Soap Hour in 1937 on NBC. 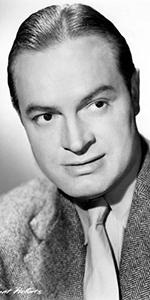 He signed a ten-year contract to do The Pepsodent Show Starring Bob Hope with Lever Brothers in 1938. Hope's first real film was Paramount's The Big Broadcast of 1938 (released in February, 1938) where he sang what would become his signature song "Thanks for the Memory." Bob Hope is known to film history for the Road films with Bing Crosby and Dorothy Lamour starting with Road to Singapore (released in March, 1940), and Road to Zanzibar (released in April, 1941). Hope had seen Lamour sing in a nightclub in New York. 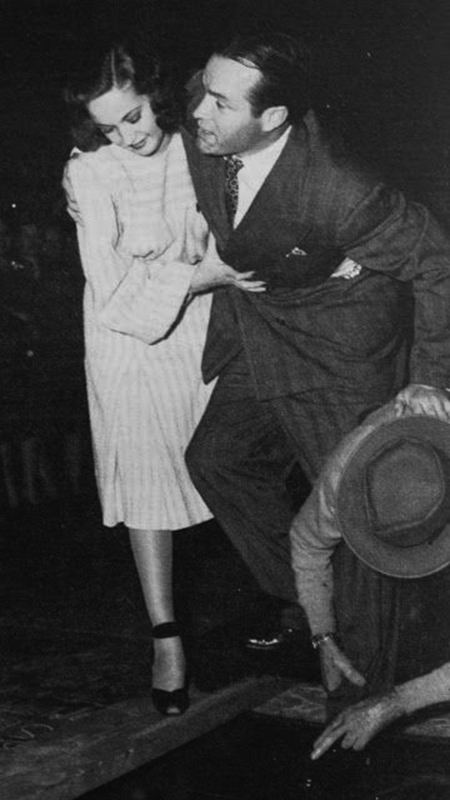 She was a contract player at Paramount, so she was included in Road to Singapore, and he invited her to perform in his USO show, beginning in May, 1941. In addition to doing their footprints together, they remained lifelong friends. The Road films had become so popular that Hope and Dorothy Lamour were asked to make their impressions at the Chinese together (Bing Crosby had been imprinted in April, 1936). Hope and Lamour would star together in They Got Me Covered (which would play the Chinese one week later, in February, 1943). The Road films continued with Road to Morocco (released in April, 1943), Road to Utopia (released in March, 1946), Road to Rio (released in December, 1947), Road to Bali (released in January, 1953), and The Road to Hong Kong (released in May, 1962). Other notable Hope films include: My Favorite Blonde (released in April, 1942), Monsieur Beaucaire (released in September, 1946), The Paleface (released in December, 1948), Fancy Pants (released in July, 1950), The Seven Little Foys (released in June, 1955), That Certain Feeling (released in July, 1956), Bachelor in Paradise (released in November, 1961), Call Me Bwana (released in June, 1963), and Boy, Did I Get a Wrong Number! (released in June 1966). Hope became known internationally for being the M.C. at the Oscar broadcasts 17 times between 1941 and 1977. He hosted (with John Cromwell) the 17th Annual Academy Awards at the Chinese on Thursday, March 15, 1945, and hosted (with James Stewart) the 18th Annual Academy Awards, held at the Chinese Theatre on Thursday, March 7, 1946. Hope also became known for his NBC Specials, which were variety programs with music and comedy, and starring some very big names, very often with Bing Crosby. Hope will always be fondly remembered for his work with the USO, where he would take his show and perform for U.S. combat troops — often at great risk — from World War II up through Operation Desert Shield in 1991. 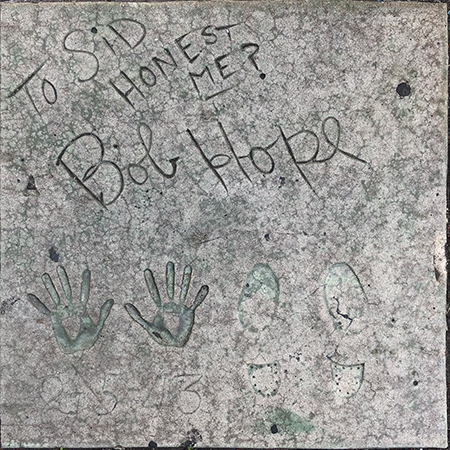 In his old age, Hope provided funds for rescuing the Eltham Little Theatre in his birthtown of London, England; the theatre was re-named The Bob Hope Theatre in 1982. Hope remained in good health well into his 90s. When he became ill with the pneumonia which would eventually claim him, his family asked him where he would like to be buried, and he answered, "Surprise me." He was buried in the Bob Hope Memorial Garden at the San Fernando Mission. He was 100 years old. Grauman's Chinese Theatre, Hollywood, California. Bob Hope Forecourt ceremony, Friday, February 5, 1943. Dorothy Lamour helps steady Bob Hope as cement artist Jean Klossner makes an impression of his shoe.